The history of the NFL draft is filled with quarterbacks: the high picks, the big expectations, and the heartbreaking busts. Finding the gem can lift your team to the heights for a decade or more. Squandering your chance can keep you in the basement for just as long. This year will be no different. A bunch of star college quarterbacks — Auburn’s Cam Newton, Missouri’s Blaine Gabbert, Washington’s Jake Locker, and others — will be picked later this week with high hopes for their success, and only a few will succeed in their transition to the NFL. Are there any guides we can use to bring some order to the chaos? Any ways to sort through the dozen quarterbacks who might get selected and figure out who will make it? Not many. We do know one thing: it’s essential to get a great one. No team the last 24 years has won the Super Bowl without a quarterback who’s been to the Pro Bowl at least once in his career. I went back and analyzed all the quarterbacks drafted from 1995 to 2006 to see who turned into a Pro Bowler and who flamed out. Check out the graphs to see what I found. The first chart above organizes the quarterbacks by draft pick, with markers for the last pick in each round (32, 64, 96…) at the bottom. The percent chance of that player making the Pro Bowl is measured on the left. As you can see, taking a quarterback with one of the top picks is a huge advantage. You’ll get a player who has a greater than 50 percent chance of making at least one Pro Bowl. But the probability falls off sharply after that. By the time we’ve reached the end of the first round, the chance of getting a future Pro Bowler drops by more than half to only one in four. At the start of the third round things are even worse: it’s only a 10 percent chance of striking gold. Oddly, there isn’t much more decline the rest of the way. 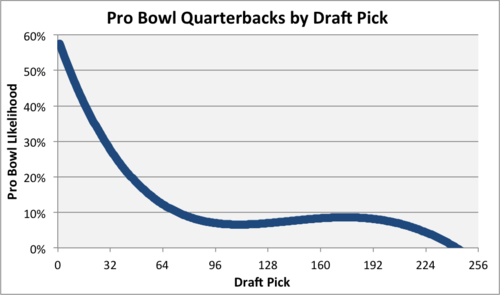 Quarterbacks drafted in rounds three through seven have roughly the same chance (or lack thereof) to make it to a Pro Bowl. We see a similar trend when the quarterbacks are arranged in the order they were selected, even though this only ranks players against the others in their class. For example, it doesn’t show that five quarterbacks were taken in the top 12 picks in the 1999 draft, but zero made it that high in 2000. Again, there’s the 50-50 probability for early quarterbacks and then truly long-shot chances later in the draft. 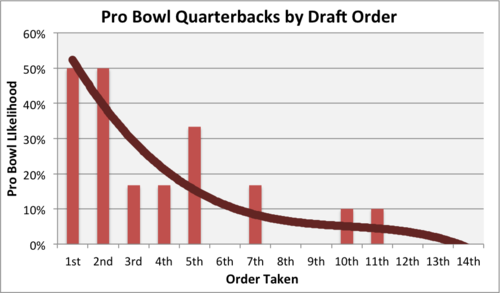 Interestingly, though, there’s no difference between quarterbacks drafted first and those picked second. Often those guys are so close that it’s unclear who’s really the best — this data backs that up. There are constraints inherent in the this data. For example, early draft picks get more chance to prove themselves as starters, and a Pro Bowl season doesn’t necessarily make a player great (see: Young, Vince). But overall this analysis shows how inherently difficult it is to find a Super Bowl-caliber quarterback in the draft if you don’t take one early on. With the first few picks at least you have a coin flip chance of success, in the second round you’re delusional if you expect better than three-to-one odds, and later on you might as well try the lottery. 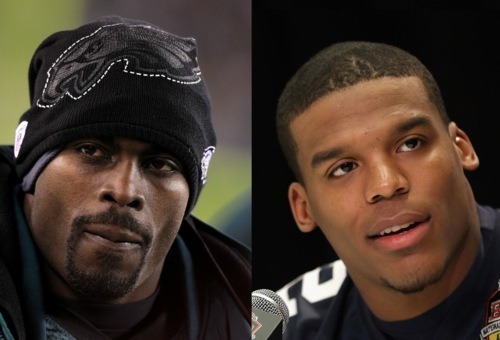 Originally published at NBC Philadelphia. Photos from Getty. Tagged with NFL Draft, Pro Bowl, Quarterback, Super Bowl, First Round, Draft Pick, Draft History, NFL, Cam Newton, Blaine Gabbert, Jake Locker, Michael Vick, Vince Young, Draft Order, Bust, College Football. April 25, 2011 by Brian Solomon.